Buy 2 copies (or more!) with embossed seal. Signed by FFRF Co-President Dan Barker. “With a majority of Foundation members growing up in religious homes,” noted Annie Laurie Gaylor, Foundation co-president, “we know there are a lot of freethinkers out there who wish they could be debaptized.” Annie Laurie, by the way, is one of the lucky 18% of FFRF members who grew up in a freethinking home and was spared baptism by water, fire or Sunday school. 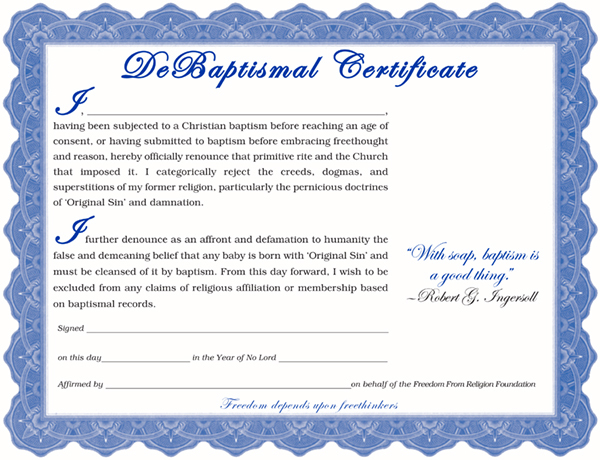 "Although our DeBaptismal Certificate has some light touches, we think it’s time to spur some serious public debate over the meaning of baptism,” Gaylor added. “We would like to remind the public that people have been killed, schisms fostered and ‘holy’ wars sparked over debates on when to baptize and how to ‘sprinkle’ babies. Childhoods and peace of mind are still being blighted today by ignorant and vicious sermons promising hell and damnation as a punishment for not being baptized.